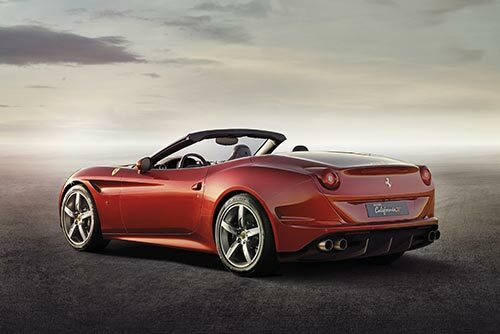 Ferrari have released details of their new California T due to be launched at the 2014 Geneva Motor Show. Following on from their successful California, launched in 2008. The T retains the same coupe/convertible 2+ layout and retractable hard top roof, while introducing a re-designed nose, similar to the FF and F12 Berlinetta and a new triple-fence diffuser at the rear. Under the skin there are a host of changes designed to make the car more economical and even better to drive. The headline change is an all-new direct-injection, 3855 cc turbocharged V8 engine, making the T the first turbocharged Ferrari road car since 1987’s F40. The new unit is mounted low in the chassis in a mid-front position. Producing 562bhp, sufficient thrust to move the T from 0-62mph in 3.6 seconds and onto a top speed of 196mph. But the new engines real gains over the old 4.3 litre V8 are in economy and torque. Torque is up a whopping 49%, while Ferrari claim a 15% improvement in economy. C02 emissions also drop by 20% to 250g/km (on the combined cycle). Ferrari are keen to emphasise that just because the T’s engine is fitted with a blower, it’ll won’t disappoint aurally. 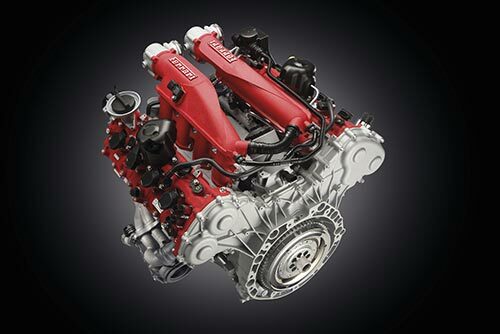 Through a new flat-plane crankshaft and exhaust manifold the T promises to serve up the typically intense, exhilarating engine sound, expected from Ferrari drivers. Ferrari also claim the T will be more comfortable to drive than the California. New springs and updated Magnaride dampers respond 50 per cent faster, giving less roll and pitch, while also sharpening the handling and improving ride comfort. New CCM3 carbon-ceramic brakes, with high performance ABS, allow the T to stop completely from 62mph in just 34 metres. Inside there’s a new Frau semi-aniline leather trim and infotainment system, controlled through a high-resolution 6.5” screen with both touch-screen and conventional controls. Between the two air vents the Turbo Performance Engineer (TPE) takes pride of place in the centre of the dashboard. The TPE display allows the driver to scroll through information on the new engine’s performance, through a touch screen interface. Prices for the California T won’t be revealed until the cars unveiling at the Geneva Motor Show in March but they’re expected to be similar to the outgoing model’s £152,154 OTR. 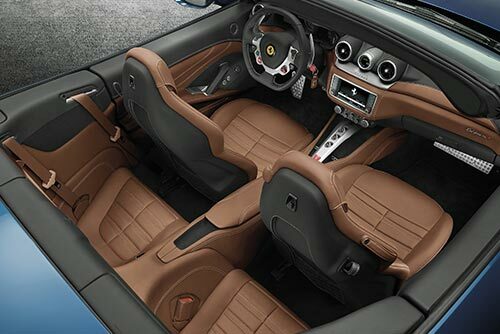 Click here to see the Ferrari California T launch video.